Cacophony is a doorbell that performs a cacophony of sound and movement. Developed in collaboration with Tord Boontje. The hammer on wheels is released, with hesitation it starts to move along the fine metal wire track. It picks up speed and rushes down the first steep slope of the track, it crashes into a steel watering can, BANG. Without slowing down the hammer keeps moving towards a glass bottle, the sound of impact is a glassy PING. Onwards through the steep corners towards the dried leaves, the doll, the tin can, CRUSH THUMP TING and finally heading towards the bell, where it ends with a loud CLANG. Although, it does not quite end there, the weight of the hammer now tips the balance of the precariously hung track and the whole thing starts to tilt over. Slowly the hammer on wheels starts to move again, exploring new forces of gravity. Giving in to a new sliding motion as the track changes shape again and the hammer reaches it’s starting point again where it comes to rest. 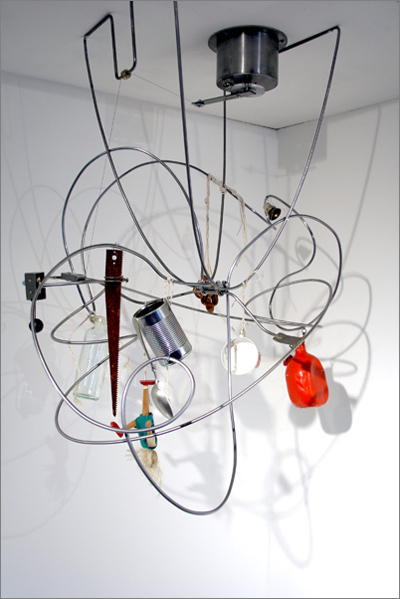 Materials: Stainless steel, found objects, motor and custom electrics. Dimensions: Height 1200mm/47.5" Width 900mm/35.5" Depth 650mm/25.5"
Power: 12v motor and gravity. 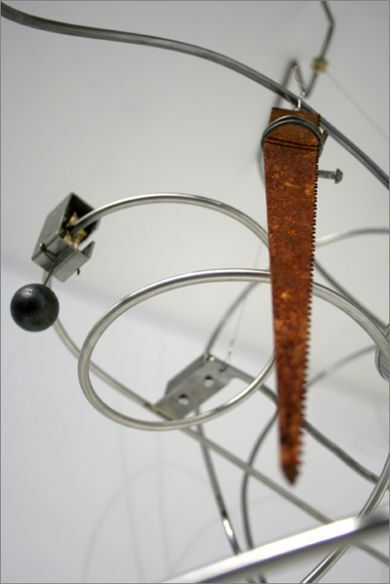 'Cacophony' , With Movement, Milan 2012. 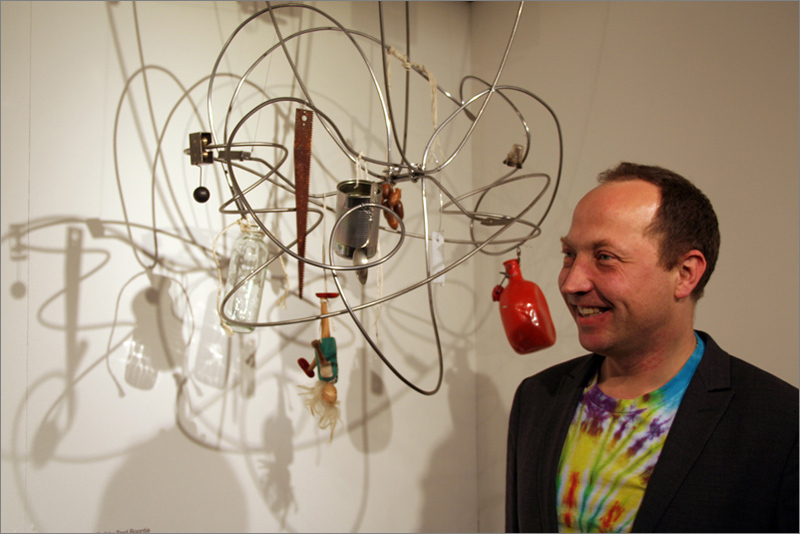 Tord Boontje with 'Cacophony', Ventura Lambrate, Milan, 2012.